(1) Loop Type : In the loop type system lubrication line starts from pump and ends at the pump covering all the points in the loop form. At the end pressure building is sensed by special valve and the line changes from I to II. Normally this is employed in the lubrication of turbine, earthmoving equipment like shovels/draglines. (2) End Type : In this case line is taken from the pump and at the end pressure relay senses the pressure and gives the electrical signal to the reversing valve mounted on the pumping station to change lubrication line from I to II, as used in steel plants, cement plants. In both cases it comprises of (1) Pumping Station (2) In line filter (3) Dose feeders, (4) End Pressure relay or Pressure V change over valve (5) Tubing & Fitting (6) Control Panel (7) Grease Transfer Pump (Optional). It is a motorised high pressure DUAL LINE grease pump for intermittent working with various accessories. Seven standard models are available. Customer has option to select suitable model/size depending upon requirement. The pump is driven by an electric motor / coupled with a reduction gear box through a flexible; coupling. On the gear box output shaft, a cam is mounted which drives no. of spring loaded high pressure pumping elements. These pumping elements are positioned radially on a ring, on which a reservoir is mounted complete with tell tale rod assembly for indicating level of grease. Pumping elements push grease at high pressure through seamless tube to a junction block. A pressure relief regulating valve is incorporated in the line to relieve the excess grease pressure to the tank. Grease is further fed through a filter to change over valve. Function of change over valve is to deliver grease through one of the outlet ports alternative! after receiving signal from over pressure relay. Pumping station, piping, dose feeders, end pressure relay, pressure reducing valve are fitted as per decided scheme and the items are connected with control panel. When pump is started grease shall be delivered to first main line and it will finally reach to connected lubricating points through dose feeder. Once grease is delivered to all points pressure in line starts rising as pump is still supplying grease. As soon as pressure crosses set pressure value, pressure reversing valve, through control panel actuates. Grease starts flowing into second line. Delivery of grease to lubricating points takes place and pressure rises again. When it crosses set pr. of end relay, system stops. Cycle is over and all points are lubricated. Now after preset 'OFF' time, system starts again and repeats above sequence. 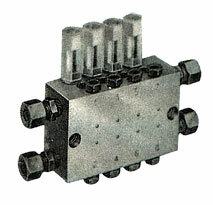 Dose feeder is a steel block having two inputs to be connected with dual line coming from the lubricating pump. Outlet connections of dose feeders are connected to lub points by branch pipe line. 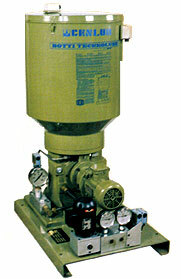 Dose feeders are normally installed in the vicinity of lubrication points to be greased. Discharge quantity can be adjusted with the help of screw. Functioning of each dose feeder can be noticed by the movement of indicating pin. DLDF11 dldf12 1 twice in each cycle. BM 4/1 1 BM 4/2 2 side outlets. BM 6/3 3 BM 6/4 4 in each cycle. BM 8/1 1 BM 8/2 2 joined, max. The basic function of the valve is to divert grease frorn line I to line II as soon as sufficient preset pressure reaches on the valve. Reversing valve must monitor grease flow alternatively from one supply line to the other, simultaneously putting the first on in relief position. This operation gets repeated in the opposite direction to complete the cycle. This reversing valve which is hydraulically operated in suitable from 150-400 bar. It is suitable for flow of grease from 45-50 kg/hr. 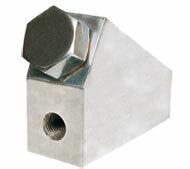 pressure setting in the valve can be done with the help of relief screw. For change over signal there is a micro switch attached to rod of the valve. This reversing valve is most reliable device to be used in dual line system. Its commanded by a 3 ph motor. Reverse pressure of the system is adjustable by means of end of line pressure switch. There are 2 micro switches which control both movement and position of reversing piston. It is suitable upto flow of 80 kg/hr of grease. Operating pressure is upto 400 bar. It senses the end pressure in both the lines and gives signal to change over valve through control panel. 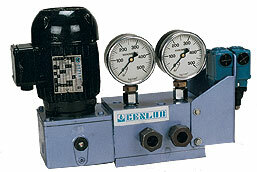 To check pressure two pressure gauges of suitable range are provided. 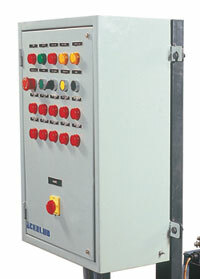 Pressure switches are mounted to register pressure and give command to panel. This pump is directly mounted on the barrel. it transfers the grease to the pumping station. It is available in pneumatic as well as motorised version.